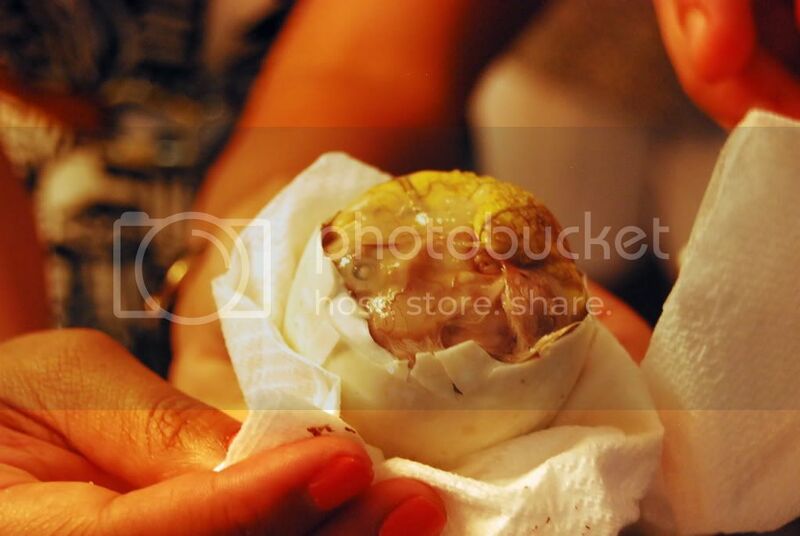 Every Little Cloud: Balut...pronounced "bah-loot"
Balut (egg), a boiled, fertilized egg, a popular food in parts of Asia. My dearest friend and college roommate is 100% Filipino and for her birthday her mom threw her a traditional Filipino lunch...balut included. Going through college with Lolli, I experienced my fair share of traditional Filipino meals and I must admit I love it all. The sweet sausage, the goat stew, a whole fish cooked to perfection, the soups and the sauces, the beef and the shrimp. If there is one thing that the Filipino culture knows how to do it is feed the masses and feed them well. Until this party balut was a wise man's tale. I knew it existed, heard tales of people enjoying the layers of texture that come from eating a baby chicken, and now, after years of exotic Filipino food, I was going to experience the most exotic first hand. Lolli's dad came from the kitchen carrying the bowl of boiled duck eggs, proud and ready to devour. Chris chimed in saying he would try one. I squeamishly shied away from the table and watched as the professional cracked one open to show is the ropes. Now most food I can handle, but there is something about a little duck fetus with bone, beak and feathers, that just seems...gross. Lolli's dad finished his, told us it is easier to just turn out the lights and eat, don't let your mind freak you out, but one look at his egg threw that recommendation out the door. The visual was already there, the mind was already freaking. I will spare the gory details...but Lolli sucked hers down like a champ as this experience wasn't a new one for her, and Chris couldn't stomach the actual duck so after tossing the fetus aside he enjoyed the rich flavor of hard boiled yoke. I tried a bite of the yoke but really couldn't get past what had been inside the shell only moments before. Glad to have the experience but one that I will most likely sit out on next time.